I recently took delivery of my 2014 Chevy Spark EV. I have been (im)patiently waiting to buy this car since GM started releasing specs on the powertrain, as the numbers were shaping up to be pretty good for a fun, sporty EV. My wife has a Nissan Leaf as her daily driver, and I previously owned a Think City, and while both were very practical, I wanted something more fun. I bought the vehicle from Wentworth Chevrolet in Portland and had put my order in shortly after the Spark EV went on sale, however I had to wait a few months before the DC fast charge option was available. The process to get a car that wasn't being manufactured yet was a little confusing at first, but after bouncing between a few different people, I finally got linked up with a really helpful and knowledgeable salesman, Larry Hogan. I was able order the exact car that I wanted, and I believe it was the first car with SAE Combo charging sold in Oregon. A friend of mine works at GM and got me employee pricing, which basically covered the additional cost of the 2LT and DC fast charge options. I'm a big fan of hybrids and EVs in general, I like small cars, and I like trying new things...so I decided to get this EV hot hatch and see how it goes. From a very high level, this is the best performance value you can get from an electric car...power to weight to dollar ratio is the best on the market, aligning well with my interests. It's the quickest EV you can buy that is NOT a Tesla, and it's only $20,000 after the government tax credit, so it's a great value. I took delivery of the car last month (January 2014) and I've already started to tinker. - Daily driven...the more I drive it, the more money I'm saving on fuel! - What I build can be easily duplicated, no engineering degree required! The most obvious places to make a competitive EV are autocross and hill climbs. After reading the SCCA solo rule book a few times (SNORE!) and going to the Nationals in Lincoln last year, I decided STF seemed like the right place for it. Maybe it is, maybe it isn't, but you've got to start somewhere and that seemed like a fun class. Of course, I'll have to learn a heck of a lot by trying to petition and get it into the list of allowed cars in STF, but I guess that's part of the...um...fun? - Wheels - Class allows up to 7.5"
In theory, those are the types of mods you're likely to see me attempt/consider for this build. Some are easier said than done, but that is the kind of stuff you'd expect to do if you're trying to be competitive in STF. The local hill climb group basically follows SCCA rules and seems pretty open minded, so I expect it should be pretty straight forward to play with them too. That seems like enough background info, I'm rambling. On to the fun stuff, actually building it instead of bench racing! This isn't my first race car, and I spend a fair bit of time over there so I'm trying to increase exposure to a non-EV centric crowd as well. The first modification I've done is install a Megan Racing suspension so that I could lower it and have the ability to change springs and damping rates easily in the future. I knew I wanted to lower the car right out of the bat, but there aren't any lowering springs available for the Spark EV, so I was forced straight into a custom setup. I wanted to use some Koni double adjustables, but unfortunately the front strut bodies for the Spark are too small in diameter to accept a normal insert and I didn't want to get into a fabrication project that would be too hard for the typical person to duplicate. Megan Racing makes a kit for the gas Spark that has single adjustable dampers, accepts common aftermarket spring sizes, is fully adjustable, and bolts in. Unfortunately, the EV doesn't share the exact same suspension as the gas Spark in the rear suspension, so the Megan Racing kit isn't directly compatible. I did some pretty simple modifications to make the kit work on my car, BUT I am working with Megan Racing to figure out what parts they make (for other applications) that I can mix and match with the gas Spark kit in order to make this a bolt-in. It has been a little difficult working with their tech support in California, who is working with their manufacturing people that are overseas. With that said, I will not detail exactly what I had to do with the suspension yet. I don't want to put information out there that I know isn't the recommended path, I will put specifics out when I have a better proposed plan for others that may try to duplicate my setup. 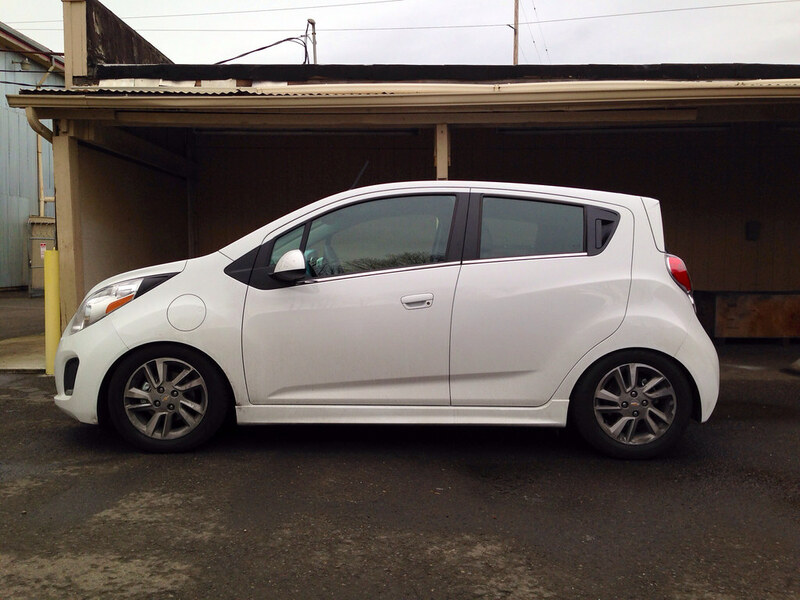 However, I can give you a teaser...this is what a Spark EV looks like about 2" lowered. Stay tuned for specific details on the suspension install...it will likely be a month or three before I'm done, as Megan Racing hasn't been in a rush to help me solve this. I did some tire and wheel mock ups at the same time, and it's not going to be easy fitting STF-compatible rubber into this thing. GM also hasn't made it easy on me as the front and rear wheels have different wheel width AND offset with surprisingly tight clearances from the factory, so wheel selection gets tricky. I bought a cheap set of worn out 205/50R15 BFG Rivals from a local crap can racer to try first, but even that will be a tight squeeze. I want to keep the stock wheels and tires together and get some lighter aftermarket wheels, so I'm still on the hunt for the right wheels. One thing is for sure, this car is in dire need of better rubber than what it comes with stock. Even on clean, dry pavement you can't use full power to accelerate from a stop without the traction control going active. Might need to put some spacers or completely new hubs on to get those wheels in. I can barely get two fingers between my fronts and the nearest contact at full-lock. We considered putting a set of the rear tires onto the front (but from Pirelli) of our Sparks here at work (3 here as of this last weekend). Not sure we won't hit the fenders on hard turns and bumps with just that small change. Try out the vehicle after each piece of metal shielding is removed (the aesthetic and sound shielding). They could be serving a secondary purpose of EMI shielding any CANbus or other serial wires inside your dash. Your dash screen and console, and any serial based aftermarket stuff, may have some noise problems. I recommend you use the slightly heavier and more expensive twisted+95% or 100% tinned-copper foil shielded CAN wire. It's out there and fairly cheap compared to power cable. Getting it pre-twisted and shielded will save you weight and headaches vs. adding to the stock twisted pair. It may be already shielded though, I haven't cut a harness open (and may not) to see. The Spark has a pretty much pure sinusoidal motor (true PMAC vs. a BLDC), so you may not have noise issues except at very specific motor speeds. This is part of why it's so efficient. Nothing to it, but to experiment. An on hand oscilloscope will help with diagnosing noise if it does arise. That or a CANbus reader, which can see error frames even if you can't read the messages... no more than a handful a second on a 500kbaud bus is solid enough for driving. I'll bet the factory system has maybe 1 every minute, if any. I'm curious to see how you come out performance-wise with those tires, this is a heavy beast for its size. They both bite, but only one is a funny story. Don't mess with the orange. 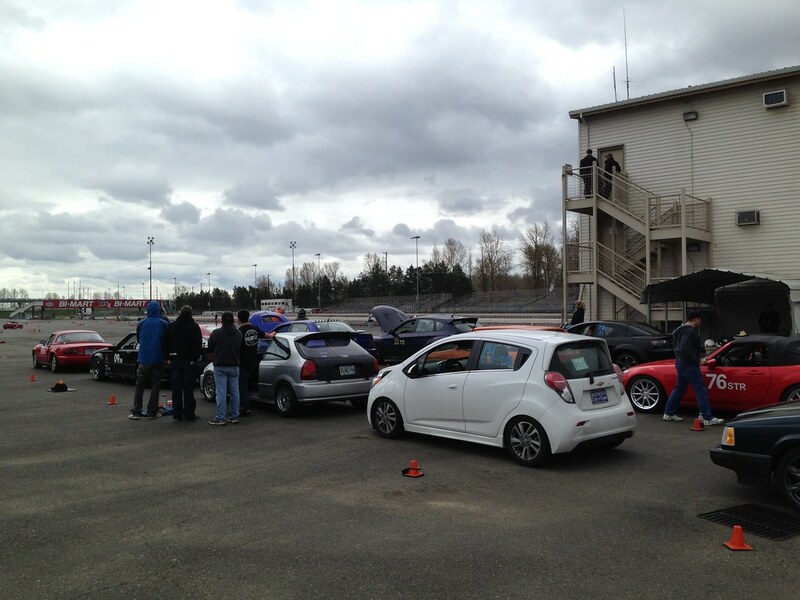 I attended the first local SCCA autocross of the season last week. The primary goal was to get a feel for the local SCCA group and shake some cobwebs loose for me, since it's been a very long time since I autocrossed with the SCCA. I was also hoping to begin the learning curve for how the traction control, stability control, and torque delivery played together with inadequate traction. I put a bunch of tire pressure into the stock tires, removed the charger/flat tire kit, and put the floormats on the passenger floor area. I used blue tape for the numbers and picked up some plastic to protect the front end paint from cones. That was the extent of my "prep" as the lowered suspension hasn't even had a proper alignment yet and I'm running horrible stock tires. A couple of guys made fun of my plastic front end protection, referring to it as "cone repellent" since I didn't hit any cones. Yes, it's true, I'm a little scared to damage the car still. Heck, I don't even have license plates on it yet! Anyway, for those that are interested I used this stuff to cover the front end. 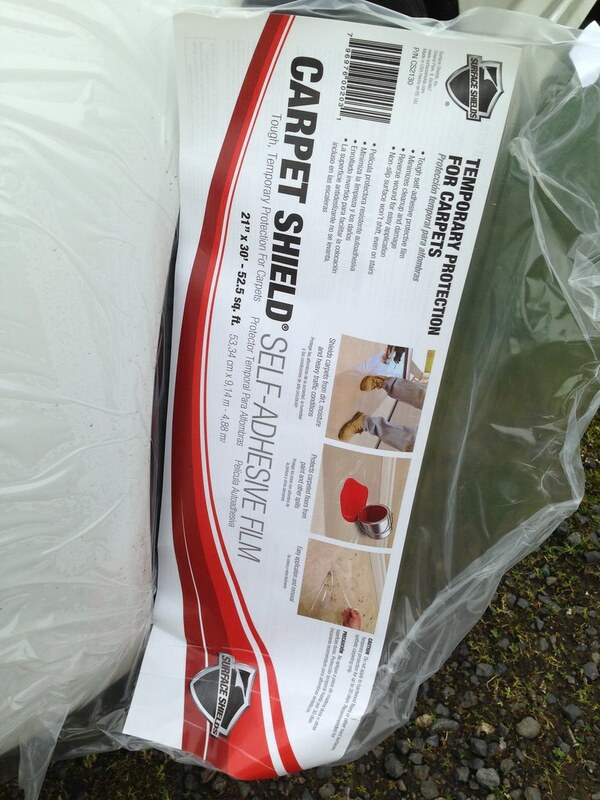 It's plastic with a light adhesive backing used to protect carpets during construction work. Maybe this is super common to do, but I've never seen it so I thought I'd share. I picked this stuff up at Lowe's, it's really cheap. After taking my turn working the course, I queued up in line. I tried my first run with the stability control and traction control turned off to see how things went; as expected, the stability control almost immediately re-enables itself at speed. The first run was ugly, but they always are. More than one person commented that they were confused why my car was so quiet, then after they realized it was electric they were surprised at how quick it was. I chilled out just enough to think to take a picture as some ominous clouds rolled in. Unfortunately, rain came with the clouds. Rain in March in Portland doesn't come as a surprise, of course, but a bummer nonetheless. The good thing is that this really highlighted the traction and stability control system functions, making it possible for me to keep track of cones AND the car at the same time. Remember, I'm no pro at this! I tried a couple of configurations with traction control on and off. The car is severely limiting power after the stability control has been active and traction control is on. The good thing is that in nasty weather, the stability control really helped to force the car in the direction I was intending to go rather than where it would go if it were turned off. The bad news is that for what seemed like an eternity (.5-1 seconds) I had little to no power until the system had stabilized on a straight path. In autocross, straight paths don't come around often, and half a second is a really long time to go without power, so if I'm really crossed up this is a major problem. The other tricky thing is that I haven't got used to what the system will allow and won't allow, and I expect this will change drastically with stickier tires, so I'm kind of at a loss. I tried the rain with traction control off to see how this affected stability control, but it was so difficult to keep the tires from spinning with this car in the rain that it wasn't worth trying a second time. For record keeping sake, my first run was my fastest (because it was my only dry run) and I ran the "Time Only" class. So, going forward, I definitely need to figure out how to fully disable/enable the traction and stability control with the flip of a switch...mostly to have a consistent car (with the systems turned off) that won't mask my bad driving while I try to figure out how to optimize the car and my driving. 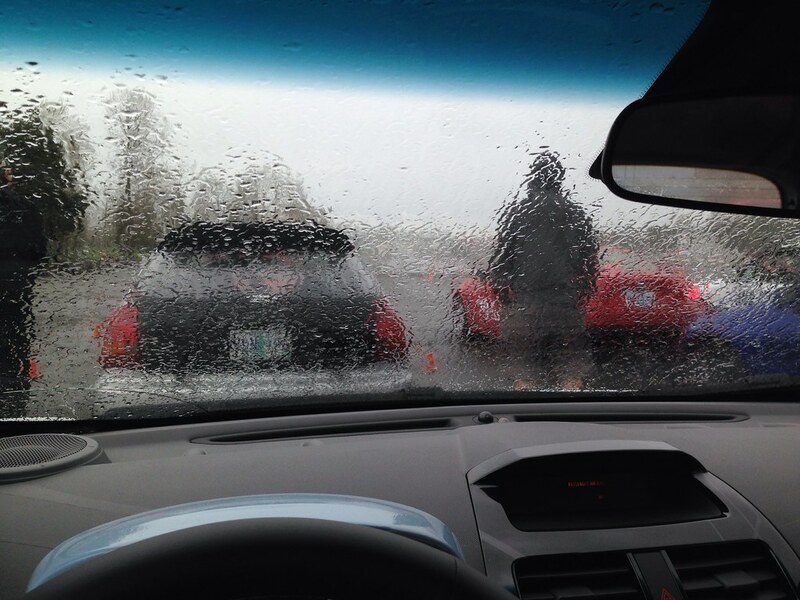 Secondly, I need a LOT more seat time to figure out the car and get acclimated to autocrossing. This weekend I'm focusing on the second point, seat time. I've signed up for a Porsche Club of America Driver's clinic on Saturday morning and autocrosses on Saturday afternoon and Sunday morning. I'm also signed up for the SCCA solo driver school coming up next month. Hopefully this seat time helps me at least get into the swing of things around the cones so I'm less frantic trying to follow the course and can give more mental focus to the car and what needs to be done to make it work better. Now I have a better understanding of why dataloggers and video systems are so popular! I might even rig up my GoPro so I can watch video of my habits and the car responses from the next autocross if I get time. Oh yeah, I forgot to mention energy consumption. Since the onboard computer has an extremely accurate energy consumption measurement and I'm in new territory here, I thought I'd keep track for those that are curious. According to the instrument cluster, I used 1.2 mi/kWh over 3.29 miles for the event itself, which included four runs. That means I'd have enough energy on board with a full charge to do approximately 60 runs on this particular day. I don't think I'll have much to worry about for autocrosses. Unfortunately for autocross, that huge battery is going to 'weight you down' (quite literally), without actually being a necessity in terms of energy storage. Doing a total battery swap is a good year long project for someone who can blow $40k+, probably out of scope. Tires should make a huge difference, but if you really want to shut down the traction and stability controls, one of the easiest ways to do it would be to send fake or duplicate signals to the controller. For example the traction control uses individual wheel sensors so use a switch to toggle just one front sensor going to both front sensor inputs, and one rear for both rear inputs. It may still detect slip via the one wheel though, so the ultimate solution is to wire all four wheels speed sensors to a small controller (ie Arduino, Rasberry PI, ARM) and pass only what you want the system to see. For other sensors involved in the stability control, things may get more complicated... I'm not familiar with stability control systems, so I don't have a good secondary suggestion for that. Alternatively, it may be possible that there is a 'disable' command via CAN, or even an analog input that will do the trick. Only way to determine that would be to get the CAN message somehow, you're not likely to find it being broadcast on your vehicle. Finally, you should see how the signal to turn off traction and stability control is being transmitted from the button in the center console. If it sends it over CAN, then we are able to read that with a CAN reader and transmit it regularly to prevent it from turning on... or if it's an analog output then we're a slave to the controller's internal logic. Investigation is required! Skullbearer, you're obviously a software/electronics guy that knows some about mechanical stuff. I'm a mechanical guy that knows some about electronics. I'll start with pulling fuses/connectors to components and see how that goes before I'll try to hack CAN signals. Also, there's a limit to what I can do here, remember that I may only "disable" the system according to the rules I posted above, not modify it to work differently. Considering that the system monitors wheel speeds, vehicle rotation, vehicle acceleration, steering wheel inputs, driver torque request, driver brake application and ABS controller feedback, etc. it's extremely complex. Just fooling wheel speed sensors would only work if we were talking about a system that only used wheel speed sensors as control inputs, but the Spark EV stability control is much more complex than that. A fun topic, but one that is way beyond the current scope. Remember, I mentioned above that what I build must be easily duplicated, no engineering degree required! KISS. As I said in the first post, no mods are planned for the "huge" battery. I could tell you lots of reasons why, but they wouldn't matter...the most important reason is that rules won't allow it. With no signals coming from any wheel speed sensor, the ESC shouldn't be able to calculate your yaw rate relative to your steering input. I saw a short video of a guy doing a ridiculous burn out in a Spark EV which tells me that they couldn't have included too many overrides that make the car undriveable with sensors disabled(unlike a Haldex system). Unfortunately, that would also disable ABS, which would hurt performance. It's a possibility, but hopefully I don't have to go to those lengths. Does the "sport" button make any difference?